"Some of the biggest future challenges facing the pig-farming sector are food safety, reducing environmental impact, biosecurity and adaptation to animal welfare legislation. The production of healthy pork is gaining importance. Food safety and quality are the cornerstones of the increasingly more integrated food supply chain. The safeguarding of animal health is therefore one of the key factors that farmers face in dealing with this challenge. Previously-existing information on washing and disinfection on finishing farms is not very positive. Very little importance has traditionally been attached to this aspect. However, farmers are currently aware that it is an essential factor for ensuring good health on their farms, as buildings and barns themselves can be the cause of some reiterative diseases and, in the long term, these can cause a steady decrease in the health and performance of animals. What are known as "sick buildings" constantly expose the animals to pathogens and toxins that lead to cytosines being released by their immune systems. It has been demonstrated that some of the most important cytosines released have growth-inhibiting properties, and for this reason it is of utmost importance to maintain high standards of hygiene on the farm, to prevent diseases that hinder the optimal growth of fattened pigs. Thus, apart from thorough cleaning and disinfection of the buildings, it is necessary to obtain information about the types of materials used inside the farms, since each material has different properties and they therefore have different results in terms of effectiveness in cleaning and disinfecting. With this objective in mind, a comparative study was conducted on the properties of concrete and polypropylene surfaces. This allowed us to obtain very relevant information in order to achieve higher standards of cleanliness and disinfection and accordingly, an improved level of sanitation. 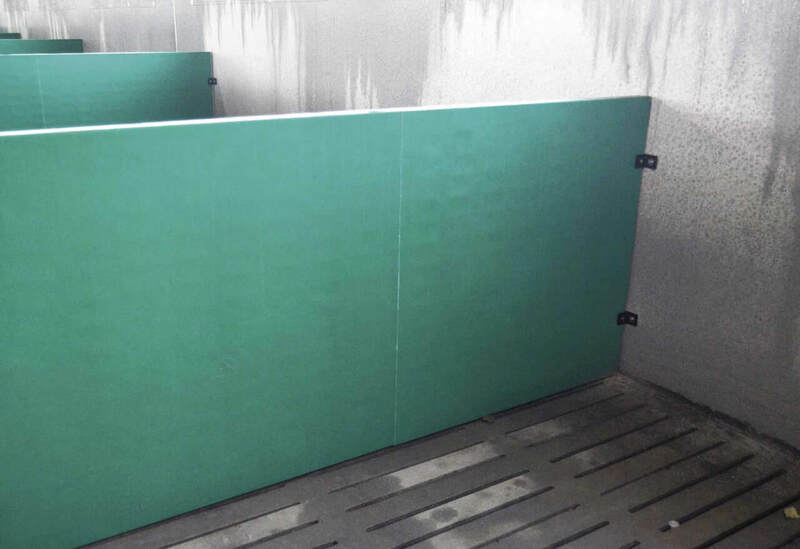 A comparative study was conducted on polypropylene and concrete panels in 12 facilities containing 1,000 pigs – 6 made of concrete and 6 made of polypropylene - and the panels were of identical characteristics. verifying the dimensions, pens and corridor in the buildings and the type of floor (compact /slatted). To evaluate cleaning costs, we recorded the times required from start to finish of the clean-up process. The cost of one hour was calculated from the average price/hour charged by cleaning businesses. The consumption of water was calculated using the meters installed on farms and, in the event of there being none, by calculating the litres/minute of water in the washing guns. In this latter case, we accounted for 80% of the time elapsed from the start of the cleaning process, in order to take breaks into consideration. Energy expenditure was calculated from the consumption by the hydraulic pumps based on the current tariff per kW. With regard to transport, the price per kilometre can cause variations in the final cost of slurry transport. We calculated two different distances in order to consider both short and long journeys. Information supplied by Gestió Agro-Ramadera de Ponent (GAP): Cost of slurry transport from 0 to 5 km = 2 euros/m3 and cost of slurry transport from 5 to 10 km = 4 euros/m3. The samples for the analysis of total aerobic microorganisms and enterobacteriaceae were collected with sterilised disposable wipes provided by the food management and safety consultant Laboratorio Convet S.L. After cleaning and disinfecting the farm and allowing at least one day for the building to dry, we defined an area in which to take samples, at a point on the panels separating the pens to which the animals had direct access. The size of the analysed surface was 1 m². The samples were taken by thoroughly rubbing the entire surface with the wipes. They were then stored in a portable fridge at a low temperature and transported immediately to the laboratory. Given that there are two variables that have a direct effect on the end results, several samples were taken from different farms in order to obtain samples under different conditions of temperature and humidity. 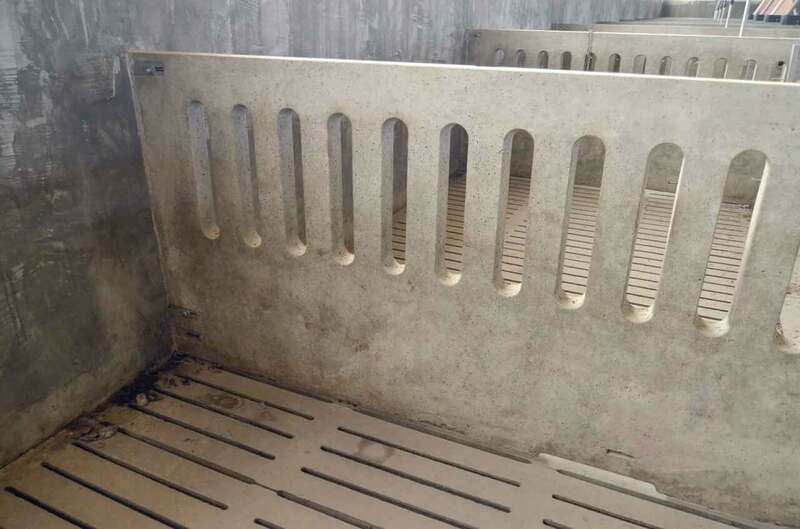 The results obtained from the farms where we conducted the cleaning tests show that in barns with concrete partitions, the average water consumption required to clean a farm with 1,000 pigs is is 35.7 m3, whereas on the farms with polypropylene partitions, 19.1 m3 of water is consumed, i.e. 16.6 m3 less than with concrete panels, which amounts to savings on water of 46.5 % on the farms with polypropylene panels. The initial count of enterobacteriaceae was 56% lower on polypropylene surfaces than on concrete ones, and on polypropylene surfaces the effectiveness of the disinfectant was 49%higher. It is hence concluded that polypropylene surfaces present a lower residual microbial load than concrete surfaces in addition to much higher efficacy than concrete surfaces in disinfection treatments. Enterobacteriaceae are gram-negative bacteria with more than 30 genera and 100 different species. They form part of the gut microbiota and are responsible for common but harmful diseases such as E. Coli or Salmonella. Financial losses arising from poor sanitary conditions are very difficult to estimate or assess but farmers are quite clear that low sanitation levels are the main enemy they must fight in order to reduce production losses or the potential implications of certain diseases on foreign trade. The data obtained from the comparative study shows that the smooth and non-porous surface of polypropylene panels makes cleaning and disinfection tasks more effective in comparison to concrete. In addition to providing a considerable saving in labour and in consumption of water and electricity, their use helps to reduce the production and transport of manure and the environmental impact. But, as has already been shown by the results, where they offer the biggest advantage is in terms of animal health and welfare, due to the efficient disinfection of polypropylene surfaces. The World Organisation for Animal Health (OIE) considers that one of the basic principles of animal welfare is the relationship between the health of the animals and their well-being. Hygiene and disease prevention are factors that should be taken very much into account, because of the influence that these have on animal health, pursuant to the principle set out in the Terrestrial Animal Health Code (2016): www.oie.int/standard-setting/terrestrial-code Faced with a scenario in which reducing antibiotics and food safety are, and will continue to be, essential requisites to ensure healthy pork production, preventing disease among animals is of primordial importance due to the need to obtain safe food for consumers. This study has demonstrated that the building materials used on farms play a major role in preventing disease. After analysing all of the factors involved in evaluating concrete and polypropylene surfaces, we can conclude that pen separator panels made of polypropylene have proved to be an extremely efficient tool in preventing disease."